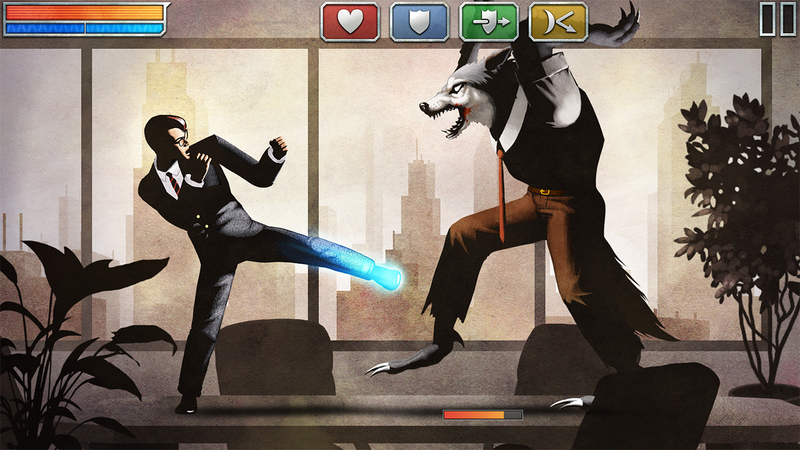 Have you ever wanted to pit a businessman against a werewolf in a fight and just let them duke it out? That's an oddly specific fantasy, but now you're able to do just that in the iOS title The Executive. In this wacky side-scrolling beat-'em-up, you're a business executive who has to defend his business as well as his city from the invasion of, well, werewolves. Riverman Media's iOS fighter is equal parts horrendous and hilarious, and the battles aren't anything too difficult -- the game just has to be seen to be believed. It's a heartfelt dedication of platforming, mining, fighting, and other styles of play that combine into one bizarre adventure that's well worth the $2.99 asking price. You really only have to worry about one finger to tap through the various segments, but don't mistake the game for being too simplistic. There are levels to gain, new attacks to earn, and other upgrades that ensure you're still playing long after the novelty wears off. Check out this new release and look forward to a full review here at Modojo.